Music festival organisers have been put on notice to lift their game on curbing drug use in the wake of a spate of fatal overdoses and after a woman almost died from taking MDMA at this year's Field Day event. Almost 200 people were charged with drug offences at New Year's Day music festivals around Australia, including at Sydney's Field Day where 184 were nabbed for drug possession and supply. Some 212 people received medical treatment from Ambulance Paramedics at the 28,000-strong event and five attendees had to be taken to hospital for further treatment. They included a 23-year-old woman who was rushed to hospital in a critical condition on Friday night after a suspected MDMA overdose. She recovered and was released from St Vincent's on Sunday morning. NSW Premier Mike Baird told News Corp Australia that festival organisers needed to do more to prevent drug abuse, declaring "enough is enough". Baird's call comes after the recent suspected fatal overdoses of Georgina Bartter, Sylvia Choi and Stefan Woodward at music festivals around the country. Baird said the permit system for music festivals would be toughened up, adding that organisers needed to take more responsibility. “In the light of this latest distressing and avoidable incident, I will be asking the relevant ministers to review the current system of regulating events held on public land, including the system for granting permits for public events such as music festivals,” he told News Corp Australia. The premier vowed to close down festival organisers who did not comply with stricter rules, according to the report. Field Day was just one of many big events held across the country on New Year's Day. There were three Falls Festivals down the east coast, Lost Paradise in NSW, Beyond The Valley in Victoria and Southbound in WA. 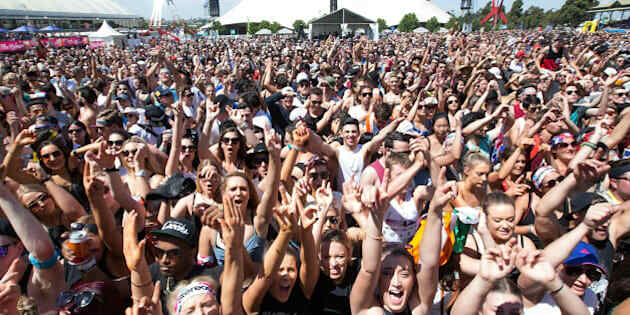 Numerous drug arrests were made at festivals, including at the Falls Festival in Tasmania. Organisers of the Byron Bay Falls Festival, which began on New Year's Eve and wraps up today, said on Friday there were no reported police incidents and the number of people seeking help from paramedics was down 50 percent. The almost 200 charges at Field Day comes as a number of drug experts, academics and advocates push for Australia to trade its zero tolerance approach for harm minimisation by legalising pill testing and drug checking facilities at recent festivals. In Sydney, those charged at Field Day included a 26-year-old woman who was allegedly found with 100 ecstasy pills, and a 19-year-old man allegedly in possession of 81 ecstasy capsules. The pair will front court in January. Chief Inspector Stuart Bell said he was concerned about the number of people charged at this year's event. “While most revellers were well-behaved, 184 drug related arrests shows that there are still some who think they can get away with possessing and supplying drugs,” Bell said. “We will continue to target drugs, alcohol-related crime, and anti-social behaviour, particularly at music festivals." The director of emergency department at St Vincent's Hospital, Professor Gordian Fulde, said the number of patients impacted by drugs at festivals was on the rise. He said there was a particular lift in people taking drugs after drinking. "I think drugs are very much increasing. I think there's also what we found in research we've done is that people drink a little ... and then somehow their decision making gets even worse than it should be," he told Channel Nine. He said he didn't think pill testing would achieve much and threw his support behind abstinence. "Don't do it. I mean, you don't need drugs."